Advocacy: The Allegheny County Library Association staff provides direct advocacy on behalf of libraries and library service throughout the County. This includes meeting with elected officials, funders, and key stakeholders to inform and educate them on library programs and services. The staff also gathers data and information on the value of library services, creates messaging and marketing materials for countywide application, and organizes resources for local library use with their boards, municipal officials, and communities. Capacity Building: In keeping with the mission of the Allegheny County Library Association, ACLA staff assists libraries in identifying more efficient and effective business models, especially those that leverage resources collectively and focus local resources on local community service. This requires broadening the vision of library boards and staff as well as developing and testing new service models. In a federated system, there is rarely a single solution countywide, but there are frequently multiple options for consideration. Compliance: The Assistant Director is the chief compliance officer. She monitors county and state requirements, coordinates communication between the State and local libraries, and provides key data for and reviews the annual reports submitted by each library. She clarifies defined service standards and tracks annual compliance. The Allegheny County Library Association coordinates a variety of workshops and forums for the system’s approximately 500 library staff and more than 400 library trustees. Ongoing professional development is essential to ensuring that county libraries are current with changes in the industry, advances in technology and best practices that keep library programs and services relevant to community needs. State regulations stipulate a minimum number of hours of continuing education (CE) that librarians must earn each year, so many workshops offer CE credits. Library Service in the 21st Century. ACLA has hosted a range of nationally and internationally known presenters to assist libraries with understanding and responding to current needs of communities. These have included futurists Thomas Frey and Garry Golden as well as library innovators David Bendekovic, Helene Blowers, Sari Feldman, R. David Lankes, James LaRue, Pam Smith, Michael Stephens, and Leslie Tetrault. Librarians as STEM Educators. The Allegheny County Library Association received a 3-year federal Institute of Museum & Library Services (IMLS) grant for the “Librarians as STEM Educators” project. ACLA is partnering with ASSET STEM Education, a nationally recognized provider of STEM training for teachers, whose staff is translating their expertise for librarians. 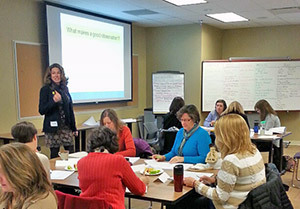 Thirty participants – youth services staff from 28 library locations across Allegheny County – will learn how to apply inquiry-based learning methodology to STEM programming and build an ongoing peer network for professional development and support. Mental Health First Aid Training. 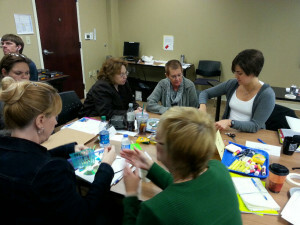 Trained instructors from Pittsburgh Mercy Health Systems lead certification sessions that promote understanding of mental health issues and provide information and resources to libraries to ensure they remain safe and welcoming facilities for all residents. Emergency Preparedness and Response. ACLA is embarking on a new Emergency Preparedness effort as part of our work with Allegheny County Health Department’s Live Well Allegheny initiative. In the event of a major disaster or emergency county libraries are called upon for up-to-date information and referrals to critical services. Libraries may be designated Points of Distribution (POD) for much needed medical and food supplies. They serve as warming and cooling stations in their communities. Libraries can also help individuals to be as personally prepared as possible. In light of recent disasters and emergencies, new best practices and information has been developed. It is imperative that libraries and the general public receive this information to allow them to best manage during an unforeseen emergency. To that end in 2015 ACLA will provide special community-based training open to library personnel, municipal staff, and residents on disaster/emergency preparedness. These training courses will be provided by professionals in the emergency management field. The goal is to ensure every library is positioned to support their communities in a crisis, and to ensure that all residents know where to turn for assistance. Child Development for Library Staff. The Allegheny County Library Association is partnering with the Pittsburgh Association for the Education of Young Children to present a series of early childhood development trainings, aimed at providing library professionals with an understanding of how children learn and the importance of promoting education outside the traditional classroom. The organizations will embark on a unique partnership to educate the Allegheny County library staff about basic child development, infant and toddler development, preschool development and school age development to help them better serve their patrons through improved programming and services. School & Public Library Partnership Conference.The Allegheny County Library Association, Carnegie Library of Pittsburgh and Allegheny Intermediate Unit partner to plan and execute the School & Public Library Partnership. The Partnership hosted annually in December provides an opportunity for school and public librarians to build and/or strengthen collaborative partnerships. The Allegheny County Library Association develops mutually beneficial partnerships with other agencies and organizations in the county, region, state, and beyond in order to bring the most up-to-date information, training, and programming opportunities to the 70+ library locations that serve Allegheny County residents. Some partnerships are for one-time events or programs and others are ongoing. The Allegheny County Library Association participates in the Children’s Choice Book Awards, a national program overseen by the Children’s Book Council. Locally, ACLA collaborates with the Allegheny Intermediate Unit to plan and hold the Children’s Choice Awards for students ages 9-12 in Allegheny County. The Children’s Choice Awards program brings schools and public libraries together to introduce young people to quality children’s literature and encourage them to read the books closely so they can discuss them and answer questions. Students read a selection of 8-10 books, cast their vote in a county-wide election for the best book, and attend a culminating event in late spring. The final event includes a Battle of the Books when students answer questions about the books they’ve read. The book that receives the most votes is announced with a celebration that includes meeting the author and other fun activities. The Allegheny County Library Association participates in this state-wide initiative to promote the importance of pre-school literacy by emphasizing the significance of reading early and often to children, as well as engaging them in conversation and other activities around books. During the month of April, libraries use the title chosen for the One Book, Every Young Child in preschool storytime, programming, and outreach to support the development of early literacy. In addition, the program provides tips for parents and other adults on reading aloud, telling stories, sharing and talking about books, and fun activities that support early literacy. A short brochure describing Pittsburgh in the doll’s historical period. Since 1952, bookmobile service has been provided in Allegheny County, an area of 745 square miles with a current population of 1.2 million. 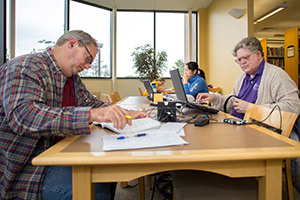 ACLA has been managing this mobile library service for more than a decade. Our experienced bookmobile staff includes the 4 full-time positions of Operations Manager, Assistant Operations Manager, Early Childhood Specialist, and Library Assistant plus 3 part-timers – one clerk and two drivers. The program has three distinct routes: one focusing on Headstart and preschool sites, one customized for senior services, and a third route that provides community service via contract to parts of the county that do not otherwise have easily accessible library service. Combined, these three routes have more than 100 stops throughout the county and circulate more than 75,000 books and other materials annually. Of the municipalities served by the preschool and senior routes, 50% of the preschool and 22% of the senior stops are in distressed communities. Of the individuals using the bookmobiles, only 13% make use of other library facilities in Allegheny County. Please visit ACLA Mobile Library Services’ website for schedule information. Each visit to a preschool facility consists of a 20-30 minute in classroom storytime and a visit to the bookmobile to select and check out materials. Mobile Services’ Early Childhood Specialist is in close contact with the Allegheny Intermediate Unit (AIU), and purchases materials in the summer months that will coincide with the curriculum being used for the upcoming school year. The classroom visit is a carefully planned program consisting of an interactive, developmentally appropriate storytime using books, props, songs and fingerplays designed to support the curriculum. At the conclusion of the visit, the teachers are left with handouts for their use and copies to send home with the children to give to their parents. These handouts contain a list of the books that were read and the songs that were sung during the story time, as well as activity and craft ideas based on the stories, and literacy tips to be used at home. Teacher support is an important service element with a wide variety of materials on board to support and enhance the curriculum, theme bags providing books and manipulatives on a single topic, theme idea books and related child development materials. The preschool bookmobile was designed with the young child in mind. The lower shelving units are forward facing and arranged in bins. Materials are displayed with the covers facing out allowing the children to select a book that catches their eye. The bins are also arranged in categories children love, such as trucks, dinosaurs, and Clifford. Senior Outreach Services are provided using a specially designed vehicle, equipped with rolling book carts, to allow a wide variety of materials to be brought directly into the facilities. The ability to go inside eliminates any physical barriers related to boarding a bookmobile, and allows many more individuals access to all the library on wheels has to offer. A staff of two are ready to help patrons with the selection of materials and to help them with any special requests they may have for the next visit. Access to library materials across Allegheny County is offered to fill requests of popular items. In addition to DVDs, music CDs, books and audio books, Activities Directors at assisted living facilities are able to take advantage of a specialized collection of resources designed to help keep older adults’ minds and bodies active through the use of word games, puzzles and crafts. Mobile Services contracts with municipalities and school districts without libraries in their community, public libraries with large service areas that wish to reach their patrons more efficiently and non-profits who wish to have service in targeted areas. The Community Services bookmobile, used exclusively on this route, is stocked with a wide variety of materials for children and adults. Much as with a traditional bricks and mortar library setting, staff know their patrons by name and chat about their families as well as reading interests. Patrons include mothers with young children as well as teens, retirees and working fathers. Any materials requested in person, over the phone or online are ready when the patrons arrive, and are added to the items selected from the vehicle’s expansive collection for check out. 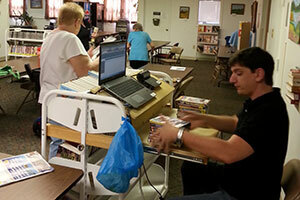 Nearly half of Mobile Services’ total annual circulation is done by the community services bookmobile. The Allegheny County Library Association secures public and private funding for county-wide library operations as well as specific programs and services. The primary funder is the Allegheny Regional Asset District which annually has committed one third of its allocations for library service since its inception in 1995. State funding is secured through the Office of Commonwealth Libraries and the Pennsylvania Gaming Control Board. Additional government funds are secured through Allegheny County. Funds are also secured from private foundations and corporations at the local, state and national level. In some cases, every library participates in a grant-funded project, and in other instances multiple libraries choose to participate. Some recently funded programs and projects include the Librarians as STEM Educators project (professional development for a cohort of youth services staff), Mobile Services (for older adults and preschoolers), and One Book, One Community (an annual program operated in collaboration with a wide range of partnering organizations). Board Governance. The Executive Director consults with local library boards on strategic planning, leadership transitions, and general nonprofit practice. She is available to resolve questions regarding the appropriate role of the board and governance policies, and to assist with interlibrary cooperative agreements. Government Relations. The Executive Director works with local officials to clarify library requirements and municipal funding options. She explains how local support impacts on other funding for the library through RAD and State sources. Fundraising. The Grants & Special Projects Coordinator meets with library directors and program staff to discuss funding needs, possible funders, and new grant opportunities. She is available to review grant proposals written by library directors and helps ensure grant compliance by reviewing reports and other paperwork. She also provides consulting about annual campaigns and planned giving, special events, and other fundraising activities by listening to needs and interests, providing information and templates, developing workshops, and encouraging resource sharing among libraries. Funders also consult with ACLA staff for perspective on local library initiatives. Compliance. As the chief compliance officer the Assistant Director provides consulting to library directors and boards regarding service standards and requirements. She collects data and statistics to help inform local library decisions regarding staffing and general operations. Youth Services. The Youth Services Coordinator supports youth services librarians in developing programs that reinforce current standards in education. She leads the Youth Services Advisory Council, a countywide committee of Youth Services librarians, who encourage resource sharing and best practices. She collects statistics and data to inform quality programming. By working closely with youth services personnel and listening to their interests and needs, the Youth Services Coordinator builds constructive partnerships, designs and implements professional development opportunities, and identifies resources for programming in community libraries. Adult Services. The Community Partnerships Coordinator continually seeks opportunities for partnerships on a county, regional, and state level that deliver programs and training that benefit all member libraries and the communities they serve. She supports libraries in their unique programming by connecting them to resources throughout the county. She also facilitates the Adult Programming Forum, open to all libraries to encourage sharing of programming experiences and best practices. She serves as a single point of contact for partnership programs requiring a county-level coordinator.